Welcome to Axios World, where two evenings a week — holidays included — we catch you up on what you need to know on the big stories from around the globe. Today's earlier edition gives you something to talk about at your BBQ, or wherever you're spending Memorial Day. Tell your friends and colleagues to sign up here, and send tips and feedback to lawler@axios.com. Situational awareness: Israel's national security adviser is heading to D.C. tomorrow to discuss Iran with John Bolton, Axios contributor Barak Ravid scoops. Former Director of National Intelligence James Clapper, whose new book “Facts and Fears” is out now, has his eyes on Russia and China. The big picture: Russia is building up its capacities for both military and information warfare “with one adversary in mind — the United States.” And "the long-term threat is China." “They want to exploit our schisms and the polarization in this country and unfortunately we are a ripe target. … They're waging this sort of soft war against us, and the other dimension that nobody pays too much attention to is their strategic nuclear weapons arsenal modernization." 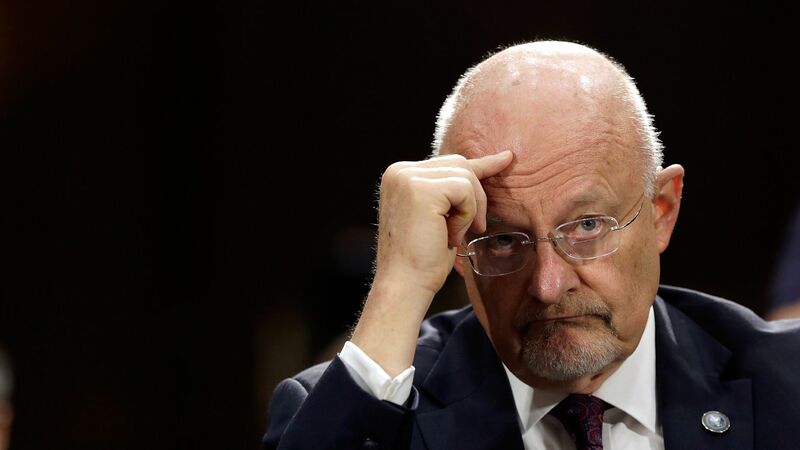 Russia is “bent on undermining our system any way they can,” Clapper says, and “it starts with Putin, who has intense animus for this countries and the values it stands for." Putin said Friday that he’ll respect the Russian constitution and step aside after his new six-year term ends in 2024. That’s no guarantee he’ll actually hand over power. Clapper says Russia will likely remain the biggest threat to the U.S. until he does. "They are very committed to what they're doing in areas like artificial intelligence, genetic engineering quantum computing. And I'm not sure we're keeping up." "And they too have embarked on a very aggressive, impressive and scary military modernization strategy which is keyed exactly to what they believe are our strengths." Just today, the South China Morning Post reported that China is conducting an average of five simulated nuclear tests per month — far outpacing the U.S. — as it develops a more advanced nuclear arsenal. Worth noting: I also asked Clapper about a man he worked directly with for years and who features fairly prominently in his book — Michael Flynn. Clapper saluted Flynn’s military service and noted that he had supported his appointment as director of the Defense Intelligence Agency before playing a role in removing him from that post. "I think it ate at him that he was terminated early and retired early, and I think he became an angry man. He was trying to reach out to several Republican candidates and latched onto Trump, and the rest was history." Watch: Axios' Erica Pandey on China's debt trap diplomacy. Go deeper: The interactive map, and what it tells us. Former Deputy CIA Director Michael Morell writes for Axios Expert Voices about what a more ambitious and assertive China means for the U.S.
"China is not only restoring its place as the dominant power in Asia, but also extending its presence and influence far beyond. Along the way, it has become the most significant global competitor the U.S. has ever faced." "The significance of China’s challenge is due to its mix of legitimate economic and diplomatic activities (those conducted within the rules of the current international system) and illegitimate ones (those outside the rules)." "Militarily, China is on a path to become a peer the likes of which the U.S. has not seen since the Soviet Union." The bottom line: "In the U.S., there is no consensus — indeed, hardly much debate — about an overarching strategy to deal with China. Without one, the U.S is doomed to continue ceding ground and possibly worse — facing China in a military contest." Go deeper: Special report on China from my brilliant Axios colleagues. Gabe Lipton and Alex Kliment write in the latest Signal newsletter that German Chancellor Angela Merkel's recent visit to China comes "as a deepening estrangement between Europe and the U.S. is reshaping Germany’s choices and challenges on the world stage." "Only 14% of Germans think the U.S. is a reliable partner these days, according to a recent poll. More than 40%, meanwhile, now see China in a positive light." "Germany and China find themselves in the same boat on trade — China and Germany run huge surpluses with the U.S., which means both are now in the crosshairs of the Trump administration’s zero-sum trade policies — and the Iran deal." "But Merkel also has a huge bone to pick with Xi about China’s tech and industrial policies, which discriminate against foreign companies, and about Beijing’s siphoning of advanced technologies through investment in European firms." The bottom line: "Trump is also upset with China about these same issues, but has chosen to take up a trade fight with its European allies rather than work with them to pressure China together. This leaves Merkel in the extraordinary position of having to find common ground with a rising competitor, because of the lack of common cause with a traditional ally." Two-thirds of Irish voters cast their ballots Friday in favor of removing a constitutional ban on abortion, a surprisingly emphatic result that comes three years after a referendum legalizing gay marriage. "I know I didn't meet anyone who would voice a pro-abortion position until I went to the U.K. [from Ireland] in 1988. This was intrinsic to Irish Catholicism, and for a long-time Catholicism was sort of an intrinsic part to being Irish." "I feel that if the 8th Amendment is repealed, then the country I left in 1988 is completely different now." Go deeper: The NY Times' Jason Horowitz on what this means for the Catholic church. On Thursday, I wrote that law professor and political novice Giuseppe Conte was set to lead a populist government in Italy. Well, Italy's president (who is not popularly elected) vetoed the choice of 81-year-old eurosceptic economist Paolo Savona to be finance minister. Conte then abandoned his attempt to form a government. President Sergio Mattarella said he couldn't accept a minister who advocated for leaving the euro, leading to a debate over whether he was overruling the will of the people, and/or acting within constitutional bounds. He asked ex-IMF economist Carlo Cottarelli to form a stop-gap government. What's next: Cottarelli says there will be new elections in early 2019. The populist parties want to block his appointment, and impeach Mattarella. Meanwhile, Italy still hasn't had a democratically elected prime minister since Sergio Berlusconi left office in 2011. The implications of the release of Joshua Holt from Venezuela. Why China wants Trump and Kim to talk. South Korea's "first responder" role to save North Korea summit. Poland reportedly offers billions for permanent U.S. military base. Cyclone Mekunu leaves scenes of devastation in Oman. Afghanistan at risk of severe drought and food shortages. World leaders criticize Trump's policies at economic forum in Russia. — South Korean president Moon Jae-in, following a surprise meeting with Kim Jong-un. Thanks for reading — see you back here on Thursday evening.